The Villa Maitagarria is located in the center of it all. One might find it hard to leave this welcoming French Farmhouse. The ground floor features an open floor space that provides lovely views with gorgeous Cathedral ceilings and a large fireplace and French doors that open out onto a beautiful heated pool and gardens. The kitchen is fully equipped with anything one would need to create a marvelous meal at home or enjoy a BBQ outside surrounded by the beautiful gardens. We had such a wonderful visit at this villa. Despite having issues trying to find it we had a very enjoyable stay. The pool is heated which we all really loved swimming in and the owners left some delicious treats for us to enjoy on arrival which we hugely appreciated. It’s in a good location and you can access lots of different beaches by car. The local supermarket is about a 10 min drive so you definitely need a car as there are no local shops nearby. Great pizzeria a few mins walk away. Would recommend this lovely villa to others! Thank you for staying with us. We are glad you enjoyed the pool and the treats that were left. We hope you will join us in the future. An original basque home set amongst lush fenced gardens made for a wonderful safe play area for the children. The pool is divine, heated and has a shallow end for the little kids and deep end for the big kids. Pool toys were available, as were beach items such as umbrella, boogie board and sand toys. Most appreciated. The house is original so get used to little square tiles in the kitchen and bathroom. Could have been a little cleaner but a quick once over by us and we were all good. Beautiful toiletries were left on each bed and were very well received. Everything we needed from wifi to tv to kitchen equipment, outdoor seating area, bbq and extra fridge space for the wine. We were very grateful that Marie could let us in a little earlier so we could enjoy a swim after a long hot drive. Response times were good and when we needed anything Marie was there. Nice and secure, reasonably priced and great location made for a lovely family reunion holiday. 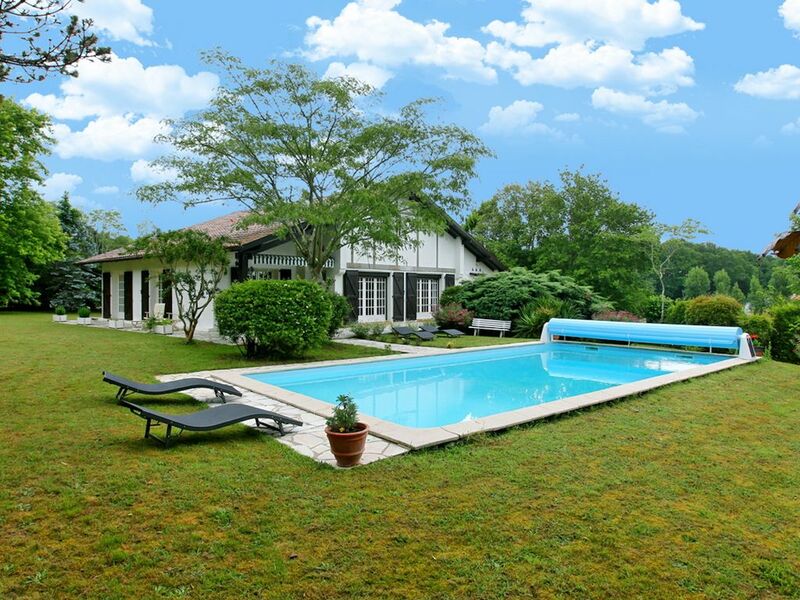 (only 15 minutes to Biarritz Airport). Thank you for your feedback it is much appreciated. We are glad that you enjoyed the pool and the gardens.